The double-sided Diamond Pocket Stone comes with a leather pouch. 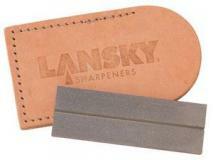 With this traditionally-shaped whetstone-style sharpener, Lansky has designed the ultimate in compact full diamond fine grit pocket sharpeners. It features a special groove down the center for sharpening fish hooks, darts, needles and other pointed objects.